(sink, shower, toilet). Standard regulatory sizes. What colors are available for the exterior of the house? We have a few wood finishes to choose from. Cedar, redwood and treated wood that can be stained any color you wish. We can also use a stain oil preservative on the wood to deepen the luster colors of the exterior wood. We can also paint it with most colors with a anti-rust paint. Dark brown colors are preferred. Your choice, please tell us what you would like and we will provide you with the finish. What is the difference between a container home and a prefab home? Container home is the actual container used to make the home from. 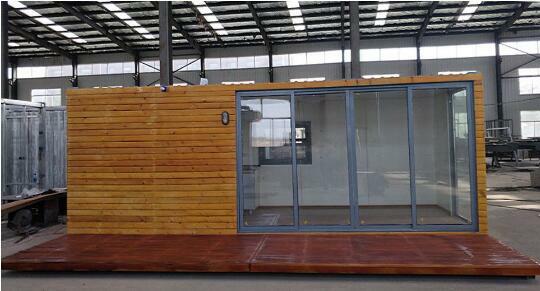 Prefab home is a slightly smaller version that fits inside a container to be shipped safely. Can you provide us with a real floor plan of the building so we can take it to our contractor or engineer to inspect it? We can provide you with a basic floor plan which will not pass the expectations/approval of your contractor or engineer in USA or Canada. What would work is if you provide us with the proper floor plan/blueprint so we can build it up to code for your state or province. This way, there will be no surprises when you receive your designed home. We will build our buildings up to the clients design/requirements. Quality and assurance is key. You can also take our basic floor plan and have it revised by your contractor/engineer and submit it to us for the final work. Also a list of materials would be required for us to make sure we will build it with the proper material. Substandard material can affect the building code inspection. OK, so if we submit a floor plan and blueprints for the container home, you can build it and have it shipped to us without any modifications/changes whatsoever when it arrives? Yes, that is the plan. However, some minor details may come up, depending on your contractor/engineer that will inspect the prefab home for living. Usually, small variances may occur but should not defer the building from being non compliant. Also, in California, any building under 120 square feet in walking space, does not require any permit. 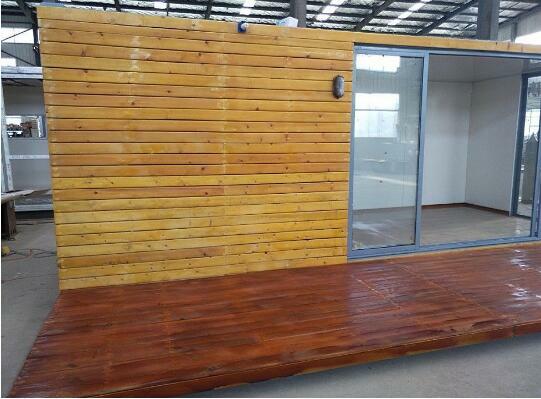 So that means, you can purchase this unit from us without the hassle of passing a building inspection from your city. All that is required is the customs clearance. That's it! We would like to see it before we buy it, is that possible? Unfortunately at this time, we don't have any built prefab homes in North America, as of yet. We hope to change that real soon so it can help our new clients with their decision. Message us if you would like to be part of our selling force in USA or Canada and purchase one from us at a wholesale price. I am skeptical on not knowing much about your company and buying a building from you. What are my guarantees that I will like what I buy? Best if you ask all the questions beforehand. And for whatever reason you are still not satisfied with the answers, simply digress from the purchase. If you would like to take a favorable chance with us, do so and we guarantee the quality will be as expected, like in the photos we provide or even better. We do not want to go through pain and suffering by simply offer you a bad designed building. We would like to start off with great quality home. Bang for your buck! 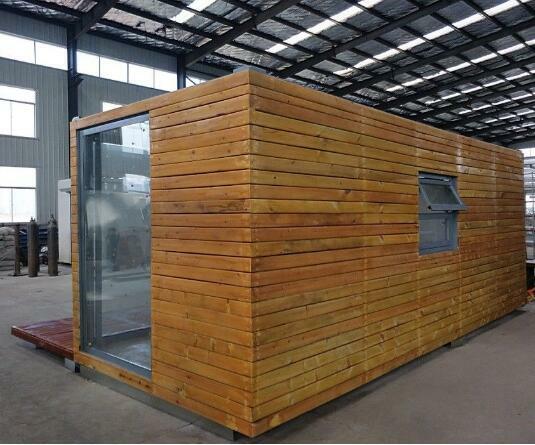 If I do decide I want to buy this prefab home from you, can I get a written contract on the stipulations of the sale? We can write a contract for you if you like, however the eBay sale is a contract as well. Whatever is written here will stipulate all necessary formalities in pursuing alternative measures if something does come in the unnecessary conflict. Can you finance the prefab home? Unfortunately we cannot. PayPal has a 6 months finance option, please check with Paypal. Otherwise, your best option would be to mortgage or personal loan our house with your local bank. All it takes is a small loan for this type of purchase. Make sure to tell your bank that you're buying a large shed for your back yard or lake if you're in California. Other states may offer the same exemption of purchasing a shed under 120 square feet. You can explain to the bank the details and they will arrange the appropriate loan to be approved for. Our shipping cost is $2995 which includes insurance on the full value of the building to the USA. Other countries, please inquire through the eBay messaging system. Will you deliver the building to our address? No, we can only deliver it to the nearest seaport of entry to the United States. All duties, tariffs, terminal fees and taxes will need to be paid by you, the buyer. We will provide all the paper work with ISF filing to your broker or yourself. Our best advice for you is to hire a custom broker and boom crane/freight company to successfully deliver the container home to your location. All it takes is a google search and a couple calls, done! We can help you look for these companies in your local area and even help you with calling if you do not have the time to do so. We'll do our best for the process to go as smooth as possible. How much are the fees to clear the container home? Usually it will be between US$2000-US$5000. This all depends on how much you will be prepared for the clearance. Custom brokers charge around $1000 for this type of work. Duties and taxes can vary from $500-$2000, depending on the HS code and state taxes/duties for this container. Once the container arrives at US customs, your custom broker or yourself will receive the costs associated from US customs. These costs may include, terminal fees, storage fees, moving fees, document and transit fees. Some, none or all fees may be included. These fees are out of our control and only determined by the seaport US customs officials. It seems all the costs are adding up quickly with all the things I have to do, can I get a better price on the unit? Make an offer and if the price you offer falls in our cost effective boundaries, we will be able to sell it to you at a reduced price. However, low ball prices are not accepted and quite offensive to offer. We can also offer a reduced price for this who wants to share our buildings with others in your area by promoting and selling them to your friends and the public. This is not a pyramid scheme but simply a resale of our houses. Send us a message and perhaps we can work out a deal. We are still deciding on what we should do. We are interested but we are afraid that the building may not pass customs or building code inspection approval. What do we do if this happens? Passing customs is very simple. There will be no problem for a professional custom broker to help you with customs. I understand that there is concern on having the building pass building code inspection. From previous questions that was asked, if you provide to us a floor plan and blueprints for the building, one or the other is fine as well as a list of materials required, the building inspection should pass without a hitch. Our buildings are SGS approved which means the main structure has been approved by the international safety organization, which stands for "Standard Global Services". Also, check with your local state building code inspectors if you can purchase buildings with a walking surface of 120 square feet or less. Each state varies in the size allowed without a permit. California and New York states are known to have a no permit allowance on sheds that are 120 square feet or less. 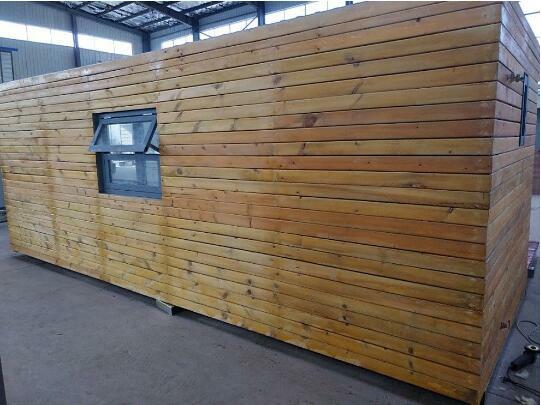 If you're from New York or California, we can work on the customization of our 20Ft container only.